I run a health and fitness blog with my brother and for the longest time it wasn’t receiving much traffic. Only 25% of the blogs in the world get over 100 people a day to visit them. Getting a 100 people to come to your blog every single day shouldn’t be hard but it is nearly impossible if you don’t have a strong foundation of content so before you worry about traffic you need to worry about content. To make $100,000 a year you need to average around $8,333.33 a month. Of course, this is before taxes but since taxes are different everywhere let’s just go with that number. A good question to ask is how much traffic do you need to make that number happen. However, it is the wrong question because your blog’s revenue is more dependent on its revenue model than the type of traffic you receive. For example, I made over $11,000 from this blog in one month on less than 10,000 pageviews. I was making money by providing services and that means I didn’t need to reach a ton of people, I just needed to reach the right people. There are some revenue models that are completely dependent on traffic, like ads, so if that is the model you go with you can figure out how much traffic you will need to make 6 figures a year (hint: a lot). If running ads isn’t your thing then you need to sit down and figure out how many people you need to purchase a product or service of yours. If I sell my Pinterest Course for $197 I would need to get 43 people a month to purchase it to reach my goal of six figures a year. That seems easier to do than trying to get millions of people to my blog. By now hopefully, you understand that you can’t even worry about traffic until you focus on your content and you don’t need a ton of traffic to make good money with your blog. But that doesn’t mean you still shouldn’t aim to get as much traffic as possible. What you’ll learn next are the tactics I use to drive 100s of thousands of people to my network of blogs. None of these tactics are sleazy or stuff you would be ashamed of doing. In fact, they aren’t secrets at all but they are things that a lot of bloggers fail to do. Writing, publishing, and hoping for the best isn’t going to do you much good. This is an easy one. You don’t want to waste time promoting your content to people that don’t care about it so the logical thing is to find the people that do care about your topic. Almost every niche/topic has online communities somewhere. There are blogs, forums, Facebook Groups, sub-Reddits, and other places. Your goal is to find these places and then make yourself a valuable member of the community. The mistake a lot of bloggers make is that they join these communities and they just start sharing their content. This can work if your content is the best of the best but nobody wants to know the person that only shows up when they have something to share. It’s like the friend that only hits you up when you have money. Gain a better understanding of your audience’s problems. If you really want to make money online then you need to understand the problems that your audience face. This will help you provide needed solutions that people are willing to pay for and talk about. Build stronger relationships with other bloggers. As you’ll see in a bit building relationships with influencers is one of the best ways to grow traffic to your blog. You never know where they are lurking so by simply making yourself a valuable member of a community you’re giving yourself a shot of building future relationships. This is a huge missed opportunity by a lot of bloggers simply because they don’t understand what is required to do well in Google and other search engines. Some people will tell you to only focus on great content and Google will take care of the rest. That can definitely happen sometimes by why leave anything to chance? If you want to do well with search engines you need to understand search engine optimization (SEO). See? That isn’t too bad. The problem is that many bloggers don’t do either of these things. They don’t try to target their posts around a specific keyword and they don’t bother trying to get backlinks from other sites. What you end up with is a trickle of traffic from Google when you could be looking at a mountain of traffic that is coming through every single month. I wrote a a comprehensive review of Tailwind and BoardBooster which are two popular Pinterest scheduling tools. What’s great about ranking for this keyword is that people searching for it are in the buying phase of the customer lifecycle. That means if they like my review and are convinced to try either one they have a good chance of clicking on one of my affiliate links and purchasing a subscription. To learn more about SEO check out this post on WordPress SEO. This is the secret weapon for a lot of bloggers. I didn’t understand how powerful Pinterest could be for a blog until I started to do a research for a blog that my wife wanted to start. What I found was bloggers doing over 100,000 pageviews a month just from Pinterest alone. And they were doing it every single month! I had to get in on the action and I haven’t looked back since. Most of that traffic came from Pinterest and now Pinterest is the #1 traffic referrer for the site. Over time we want to make sure it’s balanced between Pinterest and Google, but if you want to get a good start on traffic then make sure you don’t ignore Pinterest. Over 77,000 pageviews in its first 20 days. In fact, it picked up steam and did over 400,000 pageviews in its first 60 days. Why wait months to get traffic when Pinterest gives you a chance to get right away? If you browse around you can find plenty of Pinterest tips on the web. I believe so strongly in Pinterest that I’ve created a course solely dedicated to using Pinterest to get traffic to your blog. I combined these social networks because they all follow the same principles. They also have the misfortune of not being completely reliable for driving traffic to your site. Facebook and Twitter can work well for you if you’re in the business of creating viral content like videos of kids falling off their skateboards. However, just because they aren’t dependable doesn’t mean that you shouldn’t try to get the most out of them. Some bloggers have perched their whole business on top of these networks to great success. It’s always nice to build up an audience on any platform as this gives you an opportunity to spread the love that your blog is offering around to more people. Many bloggers focus on building up their Facebook Pages because they believe that is the key to driving traffic to your blog. The problem with this is that Facebook is making it more difficult every year to reach every fan of your Page. You could have 100,000 Fans but only 1,000 of them get to see your post. If you want more people to see it then you need to pay Facebook to make it happen. It’s pretty messed up but that is how they work. From a business perspective it makes sense for Facebook but what is the point in working hard on your Facebook Page if organic reach is going to continue to drop? What bloggers should focus on is building up Facebook Groups that allow you to always have a connection with their audience. Caitlin Bacher does a great job of outlining how hosting a Facebook Group benefits your business. 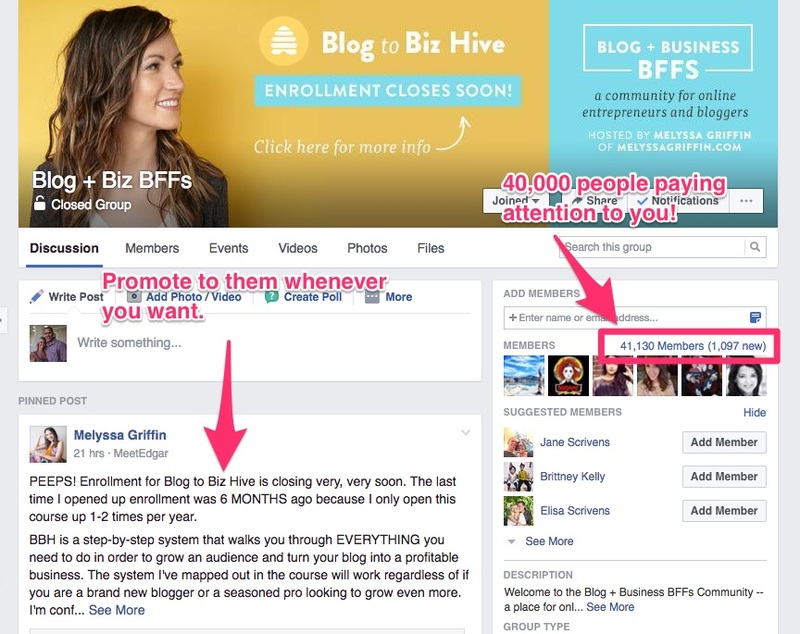 Melyssa Griffin runs a successful Facebook Group with over 40,000 members! That means when she posts something it is sure to reach thousands of people. Some bloggers are just downright selfish. They write posts that only talk about them and only link to other blog posts that they’ve written. The web was meant to be a place of immense value where sites link to other awesome sites so go ahead and link to other awesome sites. If none of this code makes any sense to you then check out Basic HTML for Bloggers. Every blogger should know basic HTML! The important part of this code is target="_blank". This tells web browsers to open the link in a new tab or window meaning that your readers will still have your site open somewhere. When you link to other bloggers they notice. Aren’t you curious about who is talking about you? When bloggers check your blog out hopefully they see something awesome that they like and turn around and link back to you. It’s just a good practice to link to other valuable resources around the web. Your site can’t be great at everything. There was this girl that I liked in middle school. The problem was that I liked her from afar. Every so often she would get a new boyfriend and I would be crushed. I’m not sure why since I never told her I liked her, I kind of just imagined it would all work out. I saw her many years later when I had finally found my confidence and we joked about middle school and I told her how much I liked her. To my surprise, she told me she liked me as well but was too scared of rejection. I missed out because I was too scared to say something. Don’t be me. If you have written an awesome piece of content don’t hesitate to email influencers in your niche and let them know about it but don’t just blindly email them telling them to check it out. Let them know how the content is going to be valuable to them and their audience. This is something that a lot of bloggers miss because for some reason they think that people that sign up for their mailing list might not care about the things they write or that they will find it some magical way. The fact of the matter is that many people are too busy to constantly check their Twitter feeds or manually refresh blogs to see if there is anything new. So if you are going to spend time building your email list then you should use it as more than just a sales pitch. People don’t mind if you are constantly serving them content in their inboxes. Sure, some people will unsubscribe but people are always going to subscribe. You only care about your True Fans anyways. A good practice is to do something similar to Amy Lynn Andrews Useletter. This is a weekly email that goes out to her audience that summarizes not only what is going on in her life but also interesting things she has found around the web. This works well because even if you don’t have anything published during the week you can still find other awesome pieces of content to share with your audience. This keeps your audience engaged meaning you and your brand don’t get forgotten in the nether regions of the mind. Depending on who you ask guest blogging is great or terrible. What’s funny is that both people are right. Guest blogging can be great. Guest blogging can be terrible. Some bloggers have found that they get very little direct traffic back from their guest posts while others see a small boost. If that is the case is it worth guest blogging at all? I think it is if you target the right blogs because you will find a boost in organic traffic that comes your way. Building up backlinks is a huge factor in getting organic traffic and guest blogging can provide you with the means to do it. As Ahrefs notes if you can target the right blogs then you will find that your organic traffic goes up. So while it might not be worth your time to guest blog for direct traffic it can end up paying huge dividends for organic traffic. It also helps to build you up as an authority in your niche along with helping you build relationships with the influencers that post your guest blogs. You would think that all that is required for guest blogging is for you to ask a blogger to let you post on their site but it isn’t that easy. Bloggers have to be picky about who they spend their time on and if you aren’t cutting the mustard then you won’t even get to present the first draft. If you don’t have an established blog then you might need to spend a bit more time establishing relationships with other bloggers before you attempt to guest blog. Very few of the big blogs accept people without some type of credentials so take the time to build those up. Show them that you have an awesome blog and you are ready to provide them with awesome content as well. Find sites that are relevant to your audience. Just because a blog has a huge audience that doesn’t mean it’s going to work out for you. You’re not going to set up a hot dog stand outside of a vegan market. Spend time researching different blogs in your niche and find ones that accept guest posts. Learn to accept “no”. Not everyone is going to be up for guest posts so it’s okay to get rejected. As your authority status grows you’ll start to see people reaching out to you to see if you want to write on their site. You just have to buckle down and continue to push through. Make it easy on the other person. When you are pitching your guest post put yourself in the shoes of the other person. They don’t have much time and that means they don’t want to spend it thinking about what topics you could write. Pitch them some topic ideas to see if one resonates with them. Accepting guest posts is another great way to gain traffic to your site assuming you only allow great content to appear. The bloggers that guest post for you know that it is in their best interest to get traffic to those guest posts so they will promote them as well as posts on their own site. Many will also include your blog in their promotional sections. You’ve probably seen these around, they usually end up saying “As Seen On…”. This gives you a chance to get a permanent link back to your site. Pretty awesome and you didn’t have to do any work! Comments on the other blogs can work out well for you if you do things the right way. The wrong approach is to just go to every blog you can find and write a very basic comment. People ignore these faster than spam emails. The goal isn’t to get everyone that comes across your comment to click your link. The goal is to get the people that really care about the topic to notice your comments and click. Imagine if you’re going through a blog and every post there is a comment by someone that always seems to be just as awesome as the content. At some point, your curiosity is going to get the best of you and you will click over to their site. Hopefully, they do a good job of keeping you around after that. Another byproduct of great blog comments is that the influencer starts to notice you as well. When Obstacle.co launched I spent a healthy amount of time writing killer comments across a number of influencer blogs. This helped to earn me a shout out by Melyssa Griffin on one of her live video streams. It’s important to keep in mind that not all blogs are created equal. If you don’t see much participation in the comment area for a blog then maybe their audience isn’t as large as you think or they don’t do a good job of keeping their audience engaged. Both of these are signs that you might want to spend time somewhere else writing golden nuggets. Question and answer sites like Quora and StackExchange are a great opportunity to establish your authority. Similar to blog comments, the goal isn’t to answer every single question that you come across. You want to be strategic and make sure that you are able to only provide high-value content to the community. You also want to make sure that it is going to be a question that is going to receive some visibility. While I’m all for helping out people, you don’t want to spend time answering a question where the only two people that see your answer are you and the person that asked the question. A great way to find high visibility questions is to look for questions with a healthy number of answers. If there are already killer answers to these questions then go and find other questions that have a ton of low-quality answers. If you find yourself writing an answer to a question and feel that it is too long then turn it into a blog post and link back to the blog post in your answer. The key is to just make sure you are authentic. These communities can smell spammers from a mile away. If you’re linking back to your site you will be placed under high scrutiny so be weary. It’s not that you can’t link to your own blog but if you are just doing it for click the community will turn on you quickly. If you’re really into trying to make your blog a business then that means you take the time to read sites in your niche. Staying up-to-date on what is going on is important for making sure you don’t lose touch with what your audience wants. When you come across a blog post from a big player in your niche that you don’t agree with then take the time to write a rebuttal blog post. You might be saying that you don’t like to be controversial and you aren’t trying to be. You are simply providing an alternative viewpoint to a topic. If done correctly, the other blogger will respect what you’ve written and hopefully share it with their audience. For this to work, it’s important that you stay on top of the conversations happening in your niche. It doesn’t make sense for you to write a rebuttal to a 6-month old blog post that people don’t care about anymore. If guest blogging is old news then webinars are the hot new thing on the block. Either way, traffic is going to go both ways. Bloggers love to cross promote and share the love around. All you need to do is find someone that has an audience that will benefit from your expertise. It doesn’t have to be in the same niche. For example, even though I don’t talk about mommy blogs, I could find a popular mommy blogger and ask her to be on my webinar where I share some awesome tips for mommy bloggers. Here is a collaboration between two awesome bloggers Michelle Schroeder-Gardner and Melyssa Griffin. If you want to try running a webinar I can recommend two different pieces of software. First, is Crowdcast and it’s the service that I use because I love its interface and features. I never experience hiccups or have to fumble around with anything. The second one is Google Hangouts which is free but requires a bit more setup and from my experience is prone to a lot more hiccups. You might have noticed something about all of the techniques outlined above. They don’t require you to spend any money. 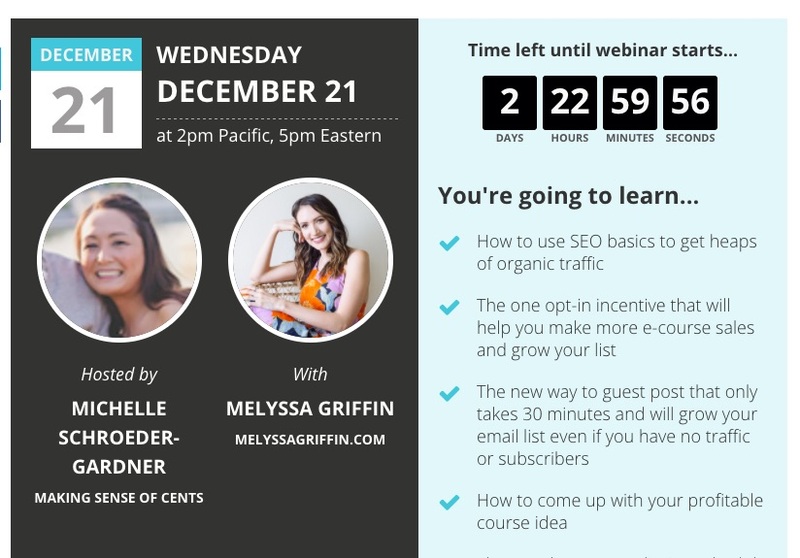 While using ads to build up a webinar or course can work it isn’t required and in fact, you shouldn’t even consider ads until you’ve maximized other methods first. It’s silly to waste your money on ads that don’t convert because you don’t have a complete understanding of your audience yet. By working on free growth methods you’ll be able to dive in a lot deeper into your audience and see what makes them tick. The most important rule for growing your blog is to always stay active in promoting your blog. It doesn’t grow on autopilot. It’s a plant that constantly needs to be watered. Some bloggers spend more time on producing good content than they do on promoting that content. This might make sense to you but the reality of it is you should be spending a lot more time promoting your awesome content and working on ways to get more people to see it. One important thing to keep in mind is that the only traffic that matters is the traffic that you can convert into revenue. Back in the days, it was fun to get a huge spike of traffic from StumbleUpon but none of that traffic ever converted. 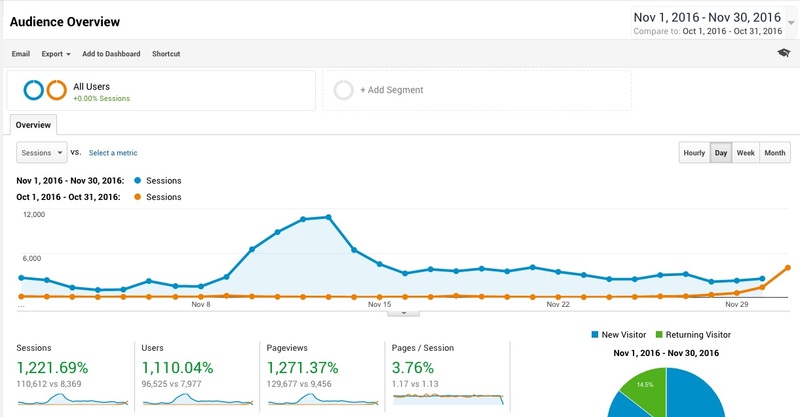 It’s interesting to see 10,000 people show up to your site and your bounce rate jumps up to 99%. It’s like owning a bookstore and everybody just comes in to read the books but never buys anything. Every traffic-building strategy that you implement needs to take into account whether or not it is reaching your audience. So today’s lesson is not all traffic is created equal. You don’t get what you don’t ask for so I’m asking you to take a second to share How to Get More Traffic to Your Blog: A Guide to Reaching More People with your audience. They respect great content.